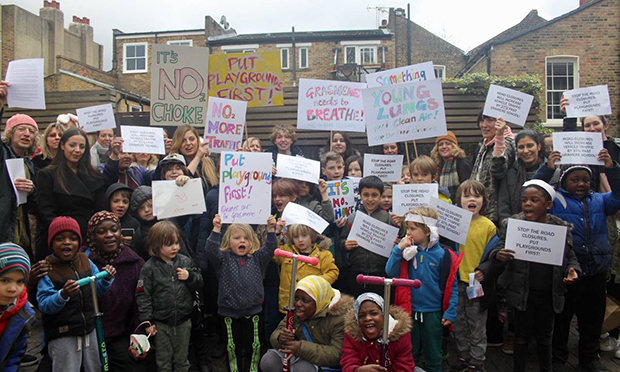 Parents at Grasmere primary school in Stoke Newington have added their voices to opposition of the council’s controversial road closures scheme – fearing it will “risk the health” of local children. Mums, dads and kids gathered outside the school last week to protest against plans to close rat-runs in the Walford Road area, which are set to go before cabinet later this month. Campaigners from CleanAir4Schools and local businesses have been fighting the proposals for months, saying they will lead to more traffic and pollution for children going to and from school and people using the nearby high street. Last week’s protest followed the long-awaited release of the Town Hall’s updated air quality analysis, which shows the road closures would lead to a 37 per cent increase in traffic on Grasmere’s side of Albion Road – tipping nitrogen dioxide (NO2) levels at the school boundary over the annual legal limit. Parent Kate Bonhote said the new report, carried out on behalf of the council by Cambridge Environment Research Consultants (CERC), makes for “worrying reading”. She said: “It shows pollution will increase here as well as at St Mary’s, Newington Green and William Patten. “If we’d known this when the council first consulted about the closures, many parents would have voted against them. “Many children here already have respiratory illnesses and for some it’s serious. Increasing pollution levels at the place they learn and play risks their health and the health of every child at this and three other schools. A petition started by Bonhote currently stands at 396 signatures – four away from its target of 400. Another Grasmere mum, Lou Power, who lives on Albion Road and runs clothes store Hub on Church Street, said: “Whether she’s at home or at school, my daughter has no escape from the pollution. People live on these roads too and the pollution levels are illegal. “Why do we deserve less protection than the less-polluted back streets? “The buses are getting cleaner – here was a real opportunity for Sadiq Khan’s initiatives to improve air quality at local schools and community streets. Town Hall transport chief and deputy mayor Cllr Feryal Demirci said: “The modelling shows that, depending on whether option A or B from the consultation is implemented, NO2 pollution would increase by three per cent or one per cent respectively at the Grasmere boundary. “The modelling predicts that air quality in the playground at Grasmere would continue to meet National Air Quality Objectives if the proposals were implemented. 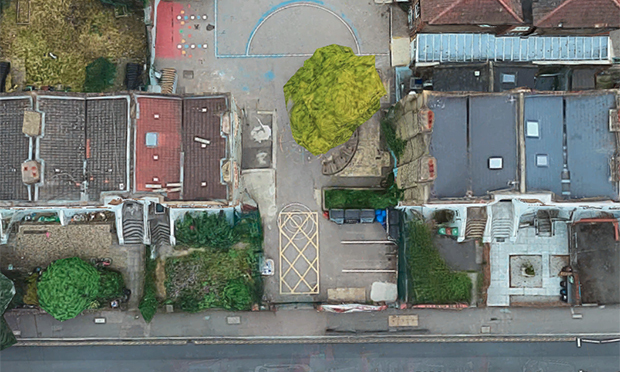 “At the boundary of the school, the modelling predicts that National Air Quality Objectives would be slightly exceeded if the proposals were implemented, but this area is currently a car park. “We are working with the school to install a green wall along the length of the boundary wall to mitigate the effects of air pollution. Campaigners and parents claim the CERC report understates the increase of NO2 at Grasmere by 15 per cent because the combination of modelling and monitoring used to provide a baseline for air quality in the area is not as accurate as diffusion tube monitoring on its own. The council says it is standard practice to use both, and hit back at campaigners for often quoting figures produced by the GLA, which it says used only two monitoring stations to judge air quality across the whole borough, compared to the 20 stations in Stoke Newington used by the council to model the Walford Road area. Another bone of contention is how the area at the boundary of Grasmere, which the report shows will become illegally polluted under the plans, should be defined. The council says the section inside the school gates, which contains three parking spaces and commercial bins but is close to the playground and not entirely separated from it, constitutes a car park. CleanAir4Schools says the Town Hall has been informed by Grasmere’s headteacher that children play in that area, and that the intention is to turn the spaces into an outdoor reading zone in the near future. The council spokesperson said: “Since we supported Grasmere School to move its entrance away from Albion Road, and carried out air quality modelling for the Walford Road proposals, the headteacher has informed us of the school’s intention to convert car parking spaces into playground. CA4S claims the jury is still out on the effectiveness of green screens, and says “they won’t protect the residents who live on these roads”. Amidst all this, the Town Hall appears to have performed a volte-face on which legal limit for NO2 should apply in a playground. Last year, it told the Citizen that a short-term objective of a one-hour mean of 200 micrograms of NO2 per cubic metre, not to be exceeded more than 18 times a year, should be applied to playground areas – using this to knock back claims from campaigners over the state of air pollution at Grasmere, Princess May and William Patten schools. The council’s stance differed from the GLA and many other local authorities which apply the more stringent annual mean of 40 micrograms of nitrogen dioxide (NO2) per cubic meter in playgrounds. But recent comments from the Town Hall, as well as the majority of CERC’s modelling, refer to the annual legal limit when discussing air quality in playgrounds. Along with the CERC report, the council recently published a six-line summary of the results of the Walford Road consultation, which closed in January 2018. Out of 2,231 responses, 61 per cent opposed Option A and 53 per cent opposed Option B. Just twenty-eight per cent supported Option A, with 38 per cent registering their support for Option B. The council says a “significant proportion of the responses raised potential air quality impacts as a reason for opposing the schemes”. Nicola Sinclair, a Grasmere mother-of-two, said: “If you’d read the council’s consultation and their summary of the air quality report, you’d think the road closures would make life nicer for everyone. She added: “The true result of their road closures will be nicer streets for the few and more pollution for the many, including our most vulnerable residents. 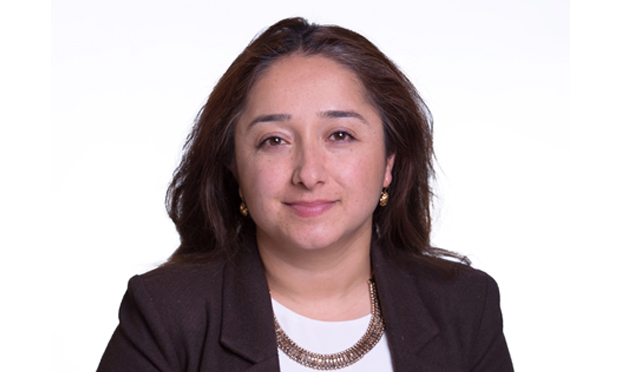 Cllr Demirci said: “We are a leader in tackling London’s poor air quality and are committed to protecting our residents from its harmful effects. “That’s why we have one of the most extensive schools air quality monitoring and support programmes of any London borough, one of the greenest vehicle fleets, a growing school streets programme, an ever-expanding network of electric charging points and an extensive programme to support businesses to switch to low or zero emissions vehicles. “But poor air quality is a London-wide problem, and that’s why we’ve got to be brave in getting more people out of their cars. “That means making our borough even better for walking and cycling with proposals like these. CleanAir4Schools member Jenna Fansa said: “The air quality report clearly shows traffic and pollution at four primary schools and numerous nurseries will increase if these road closures go ahead now. “One is already illegally polluted at the facade and the playground of another will be tipped over the legal limit. “We are simply urging Hackney Council to wait, to let pollution at schools which are so highly polluted reduce to safer levels before they consider these road closures. “Through the Ultra Low Emission Zone, cleaner air is on the horizon. Risking child health in the meantime would be irrational.